Welcome to the first edition of the Cultivation Snapshot: U.S. Wholesale Marijuana Prices and Supply produced by the research team at Marijuana Business Daily. Wholesale cannabis prices and supply can vary widely state to state, which shouldn’t come as a surprise to any savvy cannabis industry watcher. Each state regulatory body reinvented its own wheel when coming up with rules, and every cultivation and retail climate is unique, as well. But there are similarities to be explored when comparing markets. For instance, the more mature programs, such as Washington and Colorado, have experienced steady declines in prices for wholesale cannabis ower. Those like Oregon with long-entrenched black markets and plentiful outdoor farms suffer from oversupply, driving prices down. Contrast that with relatively new programs, such as Nevada and Alaska, which are reporting strong wholesale markets – for the time being. On the national level, wholesale cannabis prices have steadily slid downward since last year, from more than $1,600 a pound to just over $1,300 a pound, according to Cannabis Benchmarks, which gathers wholesale spot pricing data for the marijuana industry. Prices tend to dip most in the fall, when outdoor cannabis harvests are good the market, pushing supply up. As more businesses are licensed and cultivators build out their facilities and become more efficient, this trend line is likely to continue on the same downward trajectory. The information in this report is derived from dozens of interviews with growers and retailers in the above mentioned markets. Hard data is difficult to obtain in today’s federally illegal cannabis industry, making the most reliable source the men and women in the field. The data presented are ranges, not averages, of what the markets are experiencing. Where available, we provide a year-over-year comparison of prices. This data was not available in for states where the recreational market began in the last year. If you have any questions or want to provide feedback, please email barts@mjbizdaily.com. 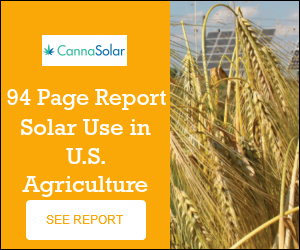 ← Cannabis growers….you’re farmers growing agricultural products…this is good for you & solar electricity!